•In Indexes tab, click on New button to bring up Create Index dialog box as shown below. •Enter a Index Name and a short Description about it. oEnable Set Doc. Relation to automatically set document relation between files and folder with the same index values. oEnable Inherit Value to inherit the index value from parent folder. Values will be inherited for the same index field even if a different profile is assigned to the parent folder. •From Data Type drop down list, select a value from Text, Numeric and Date. 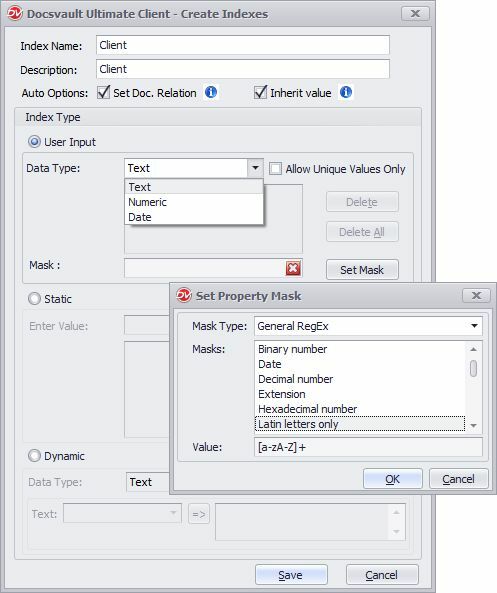 •Select Allow Unique Values Only option to avoid duplicate index values for Text, Numeric & Date index fields. •You can Set Mask to validate the index value. See Index Field Validation Masks below for more details. •Click on Save button to save the new Index. •You can apply validation masks to User Defined Text index field only. Data validation is typically used to ensure quality of incoming data. You can help users enter data correctly into your system by applying a predefined validation mask or creating your own validation rule on indexes. For example, you might use an input mask with a field that stores phone numbers so that a user enters ten digits of number. If someone enters a phone number without the area code, the system won’t go further until the area code data is added. You can apply an input mask for Text and Numeric data type indexes. Validation Mask allow you to set regular expressions to match against an index field value. For example, you can validate a Text index value which stores data in a string to match a certain pattern of characters (alphanumeric). In this way, you can check that the telephone number or invoice number is added correctly. You can define an index field value that complies with the YYYY followed by string "INV" and eight(8) digits. Numeric input masks are specifically designed for entering numeric values (integer, float values, currencies, percentage, etc.). Currency symbol: The currency symbol for display purposes only. So, if the "$9090" string is entered, the actual value stored would be 9090.